Hip injury isn't the most common sports injury out there, but it can be a significant problem when it comes to sports participation. More importantly, treating an injury of the hip can sometimes be difficult. This is especially true when it comes to chronic or gradual onset injuries. Hip pain and hip injuries can be extremely frustrating. They cause pain with your sports activities, but also with daily activities like walking and sitting. Many hip problems can be attributed to muscle imbalances, poor flexibility, or restricted mobility. Figuring out what is causing your hip pain is the key to treating your injury. Below you will find information on some of the most common hip injuries suffered in sports. Figuring out your hip pain is the first step in treating your injury. 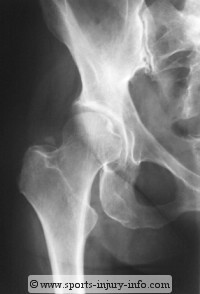 Learn more about different types of hip pain, and what may be causing it. Injury to one or all of the hip flexor muscles. This injury can become chronic if not treated correctly. This injury is common in runners and involves pain on the outside of the hip. Do you have pain in the back of your hip? If so, read on to find out if it is piriformis syndrome.